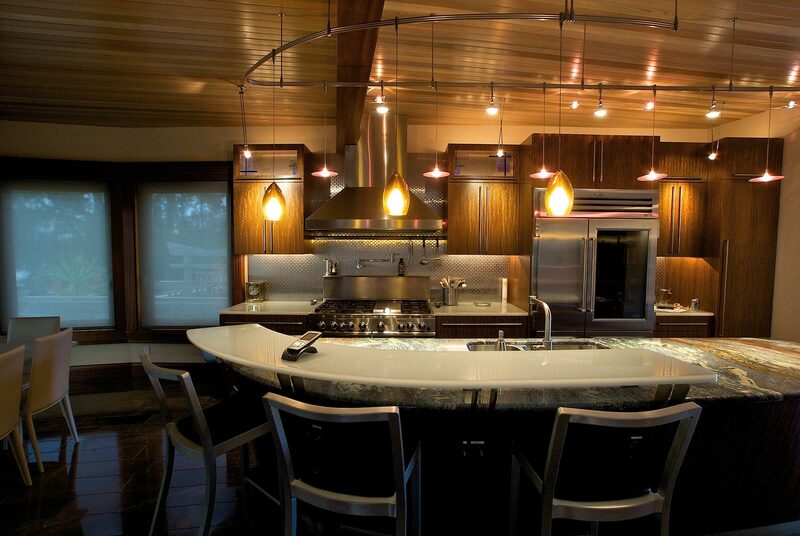 For the home of an underwater photographer, this northwest contemporary uses subtle water motif throughout. 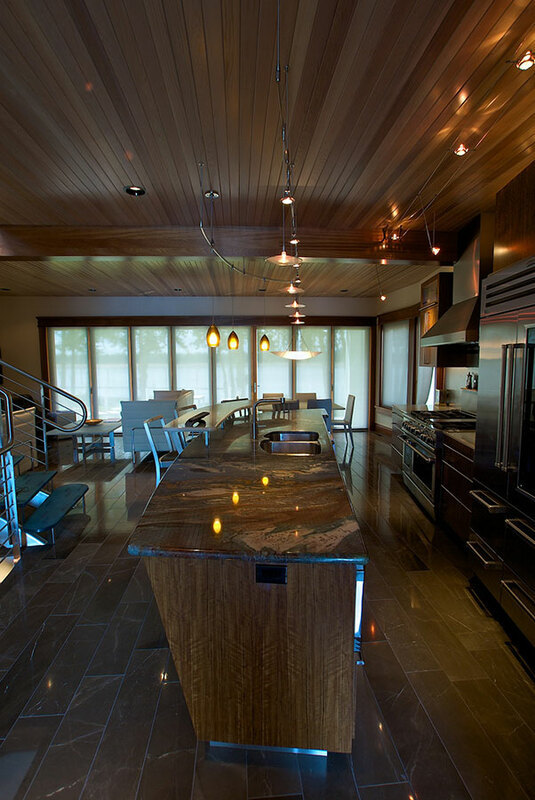 The home features sleek curved shapes, an abundant and unique use of glass, highly reflective surfaces, and warm but modernist spaces – all integrated with care. 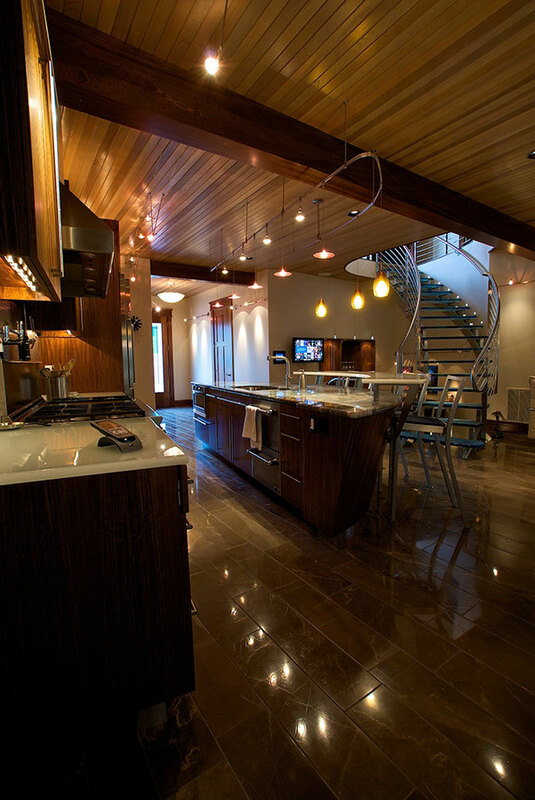 The cabinetry is of hand-selected sheets of African Mozambique, a heavilly ornamented wood. Small vertically-aligned aluminum Ann Sacks subway tiles make up the backsplash on either side of the professional range. 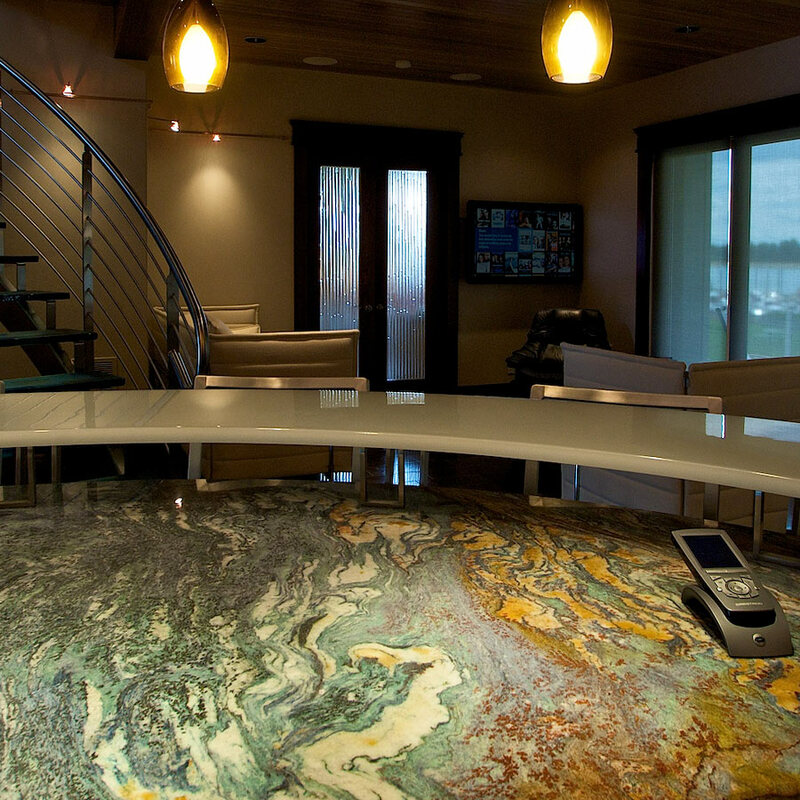 The swirling lines within the Van Gogh granite island top catch the eye. The suspended second tier is of kiln-formed glass. 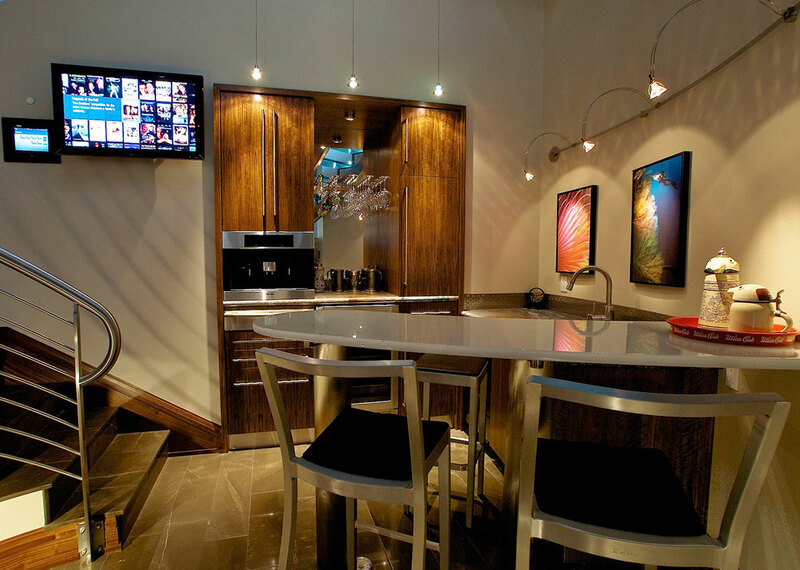 A small bar tucked under the stairs is an intimate space for socializing. 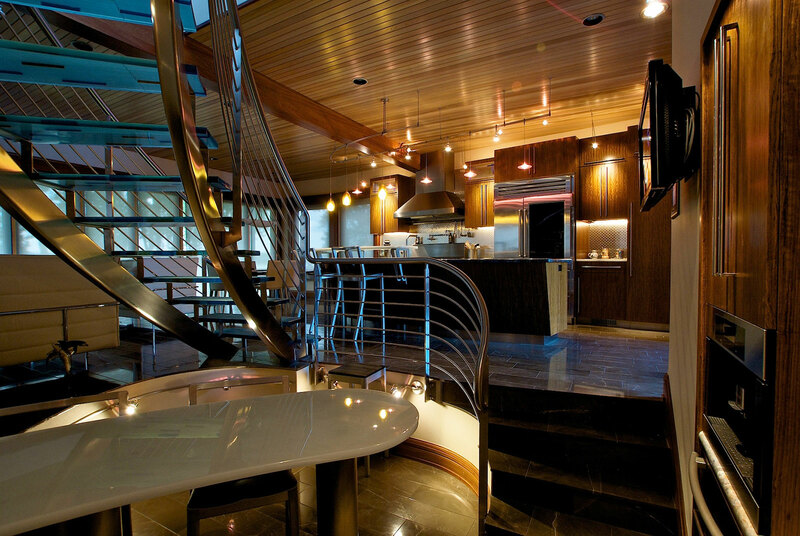 The transparent stair treads keep the bar light and airy. 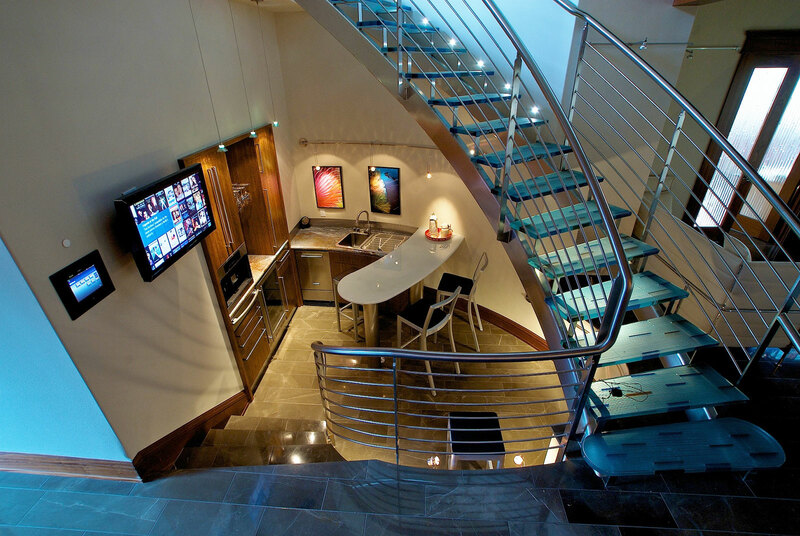 The aluminum staircase was custom crafted for this unique space. 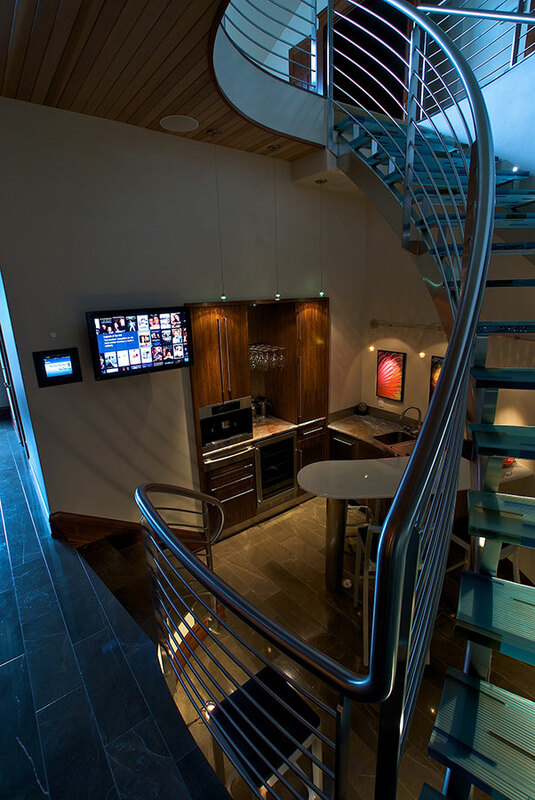 The view from the understairs bar looking up. 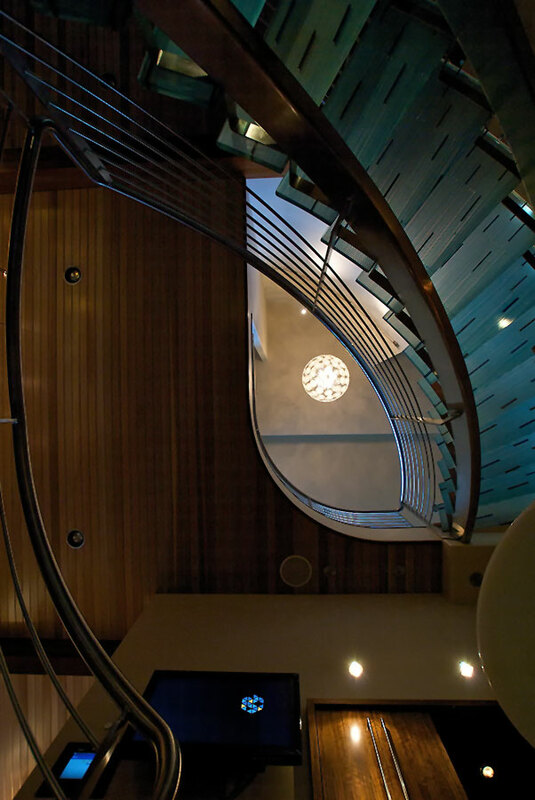 The sweeping curves of the stairway are matched by the curved ceiling lines. 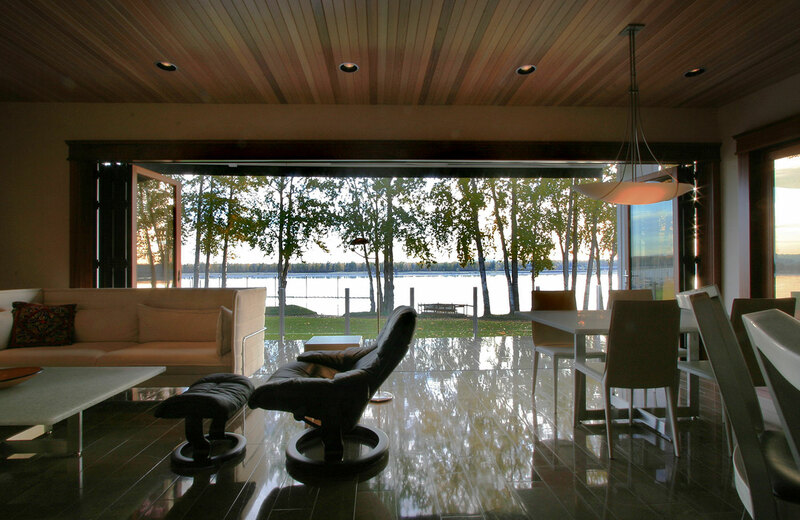 The windows facing the river pull completely out of the way for an unobstructed view of the river, reflected in the Ann Sacks limestone tiles. 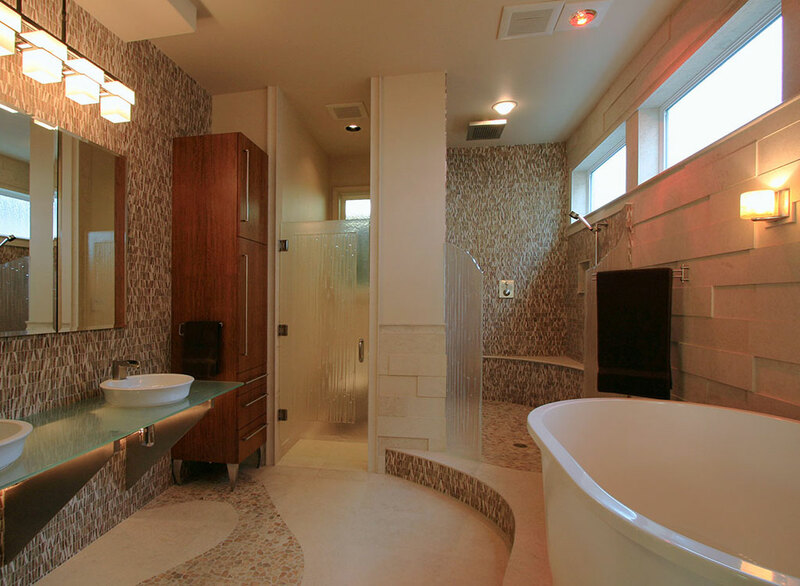 Muted greys and earth tones create a zen-like ambiance in the master bath. 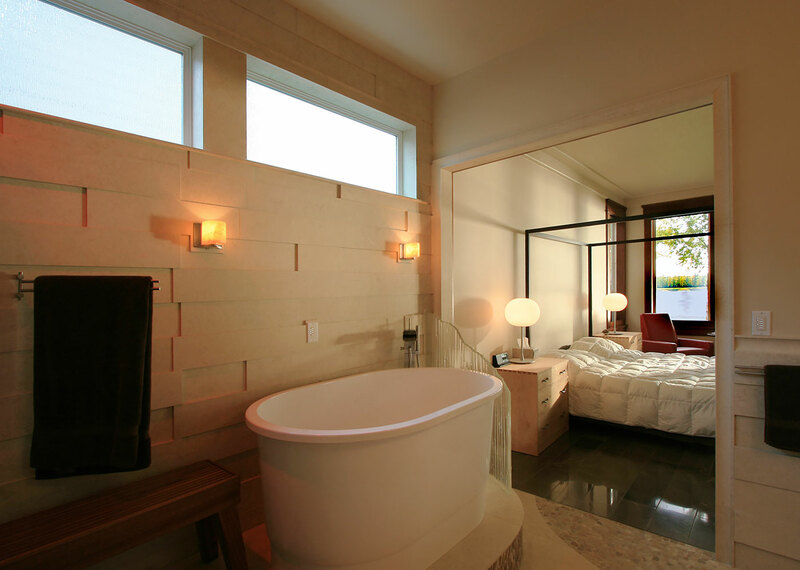 Hand-crafted glass with a bamboo pattern forms the shower surround and the small backsplash partition at the head of the bathtub. 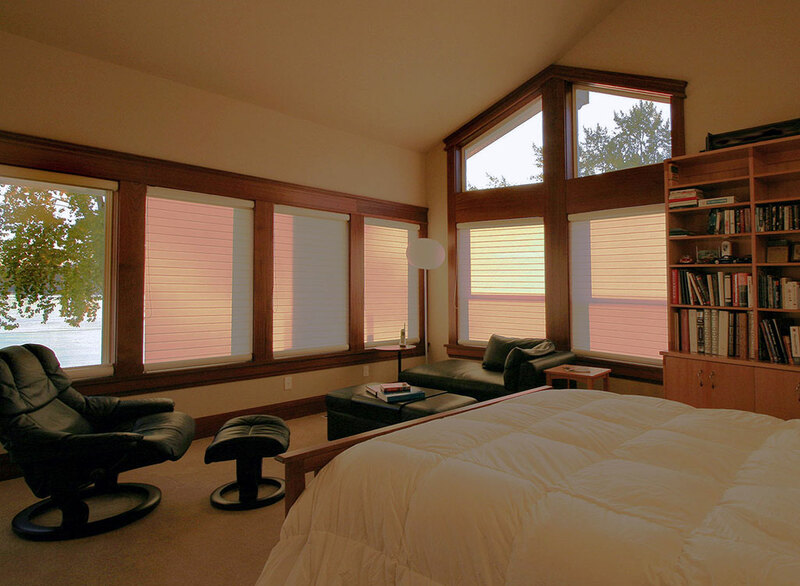 The master bedroom beyond features smooth modernist lines and highly reflective tile floor. "Becky’s strengths include excellent listening skills, the ability to translate wishes and dreams into a concrete design, and her amazing relationships with vendors in Portland and Salem."